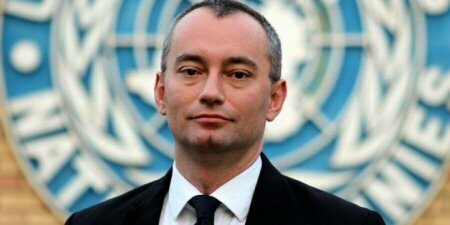 United Nations Special Coordinator for the Middle East Peace Process, Nickolay Mladenov, has condemned yesterday’s killing of a Palestinian man by an Israeli settler, and the wounding of a photojournalist. He added, according to the PNN, that this deplorable incident must be promptly and thoroughly investigated and all suspected of being involved must be prosecuted. On the ongoing hunger strike of Palestinian detainees: “I am following, with great concern, the ongoing hunger strike by Palestinian detainees protesting against their conditions in Israeli jails. “The strike is now entering its second month, and it is imperative that a resolution be found as soon as possible, in line with International humanitarian law and Israel’s human rights obligations. With growing tensions on the Palestinian street, I hope that the current efforts will result in an immediate resolution to the matter, which is in the interest of peace and ongoing initiatives to revive a political process. I call on all actors to exercise maximum restraint, show responsibility and take all necessary steps to avoid escalating tensions,” Mladenov said. In a related statement the United Nations Special Rapporteur on the situation of human rights in the Palestinian territories occupied since 1967, Michael Lynk, expressed concern about the deteriorating human rights situation in the OPT, on the eve of the 50th year of the Israeli occupation. The human rights expert was speaking after a five-day mission to Amman, Jordan, where he met with human rights groups, UN officials and senior Palestinian government officials to discuss the human rights situation. Israel has not permitted the Special Rapporteur to visit the OPT since he assumed his Mandate in May of 2016. “I am struck by the depth of hopelessness and frustration in Gaza that has been described to me this week,” the Rapporteur noted. “After ten years of closure, I call upon Israel and the international community to turn your urgent attention to this situation, which cannot and should not be ignored any longer. He also expressed deep concern about the situation in the occupied West Bank, noting that Israel controls Area C in its entirety, which makes up 60 percent of the West Bank, and which completely surrounds the Palestinian-controlled areas. The Special Rapporteur also drew attention to the current situation in East Jerusalem, where Palestinian Jerusalemites are confined to living in 13% of the area, while facing a consistent threat of losing their residency rights and considerable obstacles when applying for building permits. In its Weekly Report on Israeli Human Rights Violations in the Occupied Palestinian Territories for the week of 11 – 17 May 2017, the Palestinian Center for Human Rights (PCHR) found that Israeli forces continued systematic crimes in the occupied Palestinian territories. During the past week, Israeli forces killed a Palestinian civilian in al-Nabi Saleh village weekly protest and a Jordanian in occupied Jerusalem. A Palestinian fisherman was killed, and his cousin was wounded in the Gaza Sea. 40 Palestinian civilians, including 13 children and 2 women, were wounded in the West Bank. In the West Bank, in new crime of the excessive use of force, on 13 May 2017, Israeli forces stationed at the main entrance to al-Nabi Saleh village, northwest of Ramallah, killed Saba’ ‘Obaidi (23), from Salfit, while participating in a weekly demonstration organized at the village entrance. Saba’ was hit with a Two-Two bullet, which penetrated his abdomen and waist from his heart side. Eyewitnesses confirmed that shooting was from a distance of less than 20 meters, and the Israeli soldier directly opened fire. According to PCHR’s investigations, the Israeli soldiers could have used less lethal force against demonstrators, who did not pose any threat to the life of the Israeli soldiers. On 13 May 2017, Israeli forces killed a Jordanian civilian, Mohamed al-Kasaji (57), after he carried out a stabbing attack against an Israeli officer near al-Silsilah Gate in occupied East Jerusalem’s Old City. According to PCHR’s investigations, the Israeli forces could have abducted the abovementioned civilian; especially that he was wounded and could not move. However, one of the settlers’ guards fired another bullet at him and finished him off. Protests in solidarity with the prisoners: 33 civilians were wounded, including 12 children and 2 women. Twenty two of them were wounded with live bullets, 10 others were wounded with metal bullets and another one sustained shrapnel wounds. In the weekly protests against the annexation wall and settlement activities: 3 civilians were wounded with metal bullets. During Israeli military Incursions, 4 civilians, including a child, were wounded. Two of them were hit with live bullets and 2 others were hit with rubber-coated metal bullets. Israeli forces directly targeted ambulances, 3 of them sustained damage at the western entrance to Foreek village, east of Nablus. During the reporting period, Israeli forces conducted at least 62 military incursions into Palestinian communities in the West Bank, and 4 others into Jerusalem and its suburbs. During these incursions, Israeli forces abducted at least 79 Palestinian civilians, including 9 children and 2 women. Thirteen of them, including 3 children and a woman, were abducted in occupied Jerusalem and its suburbs, while another civilian was abducted while participating in a protest supporting the Palestinian prisoners. Among the abducted in this week, were ‘Isaa al-Ja’bari (51), a leader in Hamas Movement and former Minister of Local Government in the 10th Palestinian Government; and Ahmed Qatamish (67), political writer and researcher in the Palestinian cause affairs. At approximately 01:00, Israeli forces moved into Nemrah neighborhood in Hebron. They raided and searched a house belonging to Essa Khairi Essa al-Ja’bari (51), a leader in Hamas movement and former Minister of Local Government in the 10th Palestinian Government. They then abducted him and confiscated his car. Around the same time, Israeli forces moved into Beit Ummer village, north of Hebron, and stationed in ‘Asidah area. They raided and searched a house belonging to Khalil Abdul Fattah Sabe’i Sabarnah (40) using police dogs. They later withdrew and no arrests were reported. In the meantime, another Israeli force raided and searched a house belonging to Mohammed Salem Sabarnah and abducted his son Ramzi (22). They withdrew and headed towards “Karmi Tsur” settlement, south of the city. In the Gaza Strip, concerning Israeli attacks on fishermen in the Gaza Sea, Israeli naval forces killed a fisherman, Mohamed Baker, and wounded his cousin after opening fire at a fishing boat. This crime confirms the continuation of the Israeli policy to target the life and safety of Palestinian fishermen, depriving them of freely sailing, even in the allowed areas to fish, and targeting their livelihood. 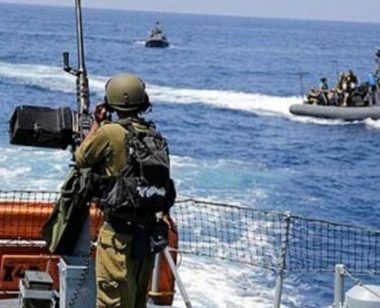 On 12 May 2017, Israeli gunboats stationed off al-Sundaniyia shore, north of the Gaza Strip, heavily opened fire at fishing boats and chased them. On 14 May 2017, the Israeli gunboats stationed off shore heavily opened fire at fishing boats sailing within the allowed area off Khan Yuins shore, south of the Gaza Strip, north of Gaza City and northwest of Beit Lahia. As a result, 6 fishermen, including 2 children, were abducted and a fishing boat was confiscated. Israeli troops used excessive force against peaceful demonstrations protesting settlement activities and the construction of the annexation wall. In a new crime of excessive use of force, Israeli forces stationed at the main entrance to al-Nabi Saleh village, northwest of Ramallah, killed a Palestinian Civilian and wounded 3 others while participating in the weekly protest organized at the aforementioned entrance. The Palestinian Center for Human Rights (PCHR) strongly condemns this new crime. PCHR hereby stresses this crime was committed after the Israeli political and military leaders gave the Israeli soldiers the green light to shed the Palestinian blood in light of the international community’s policy to tolerate Israel for crimes committed by the Israeli soldiers against Palestinian civilians. According to PCHR’s investigations and eyewitnesses’ testimonies, at approximately 13:30 on Friday, 13 May 2017, dozens of Palestinian civilians from different areas organized the weekly protest at the main entrance to al-Nabi Saleh village, northwest of Ramallah. The protest was in solidarity with the Palestinian prisoners on an open hunger strike in the Israeli jails. A number of youngsters threw stones and empty bottles at the Israeli soldiers stationed there. The Israeli soldiers immediately fired live and rubber-coated metal bullets in addition to Two-Two bullets at the stone-throwers. At approximately 14:30, a number of Palestinian youngsters approached and threw Molotov Cocktails at the Israeli soldiers stationed at the main entrance to the village. Meanwhile, 3 soldiers were on the roof of an uninhabited house, so they opened fire at the youngsters. As a result, four of them were wounded. One of them was identified as Saba’ Nidal ‘Abeidi (20), from Salfit, who was hit with a two-two bullet that penetrated his abdomen and waist from the heart side. Saba’ had run about 20 meters screaming before he fell on his face. Meanwhile, the three other wounded civilians, whom PCHR keeps their names for fear of being abducted, were hit with metal bullets to the head. A number of youngsters rushed to save the four wounded persons and directly took them to an ambulance belonging to the Palestine Red Crescent Society (PRCS), which transferred them to Martyr Yasser ‘Arafat Hospital in Salfit. Doctors there then declared death of Sabaa’ after he underwent an urgent surgery. Doctors added that the other wounded civilians were admitted to the Emergency Department for medical treatment, and their condition was described as moderate. Eyewitnesses said to PCHR’s fieldworker that Israeli forces directly opened fire at the four civilians from a distance of 20 meters. PCHR’s investigations emphasize that Israeli forces could have used less lethal force against the protestors who approached the soldiers as the latter were not posing threat to lives of the soldiers. Moreover, PCHR’s previous investigations showed that many Palestinian civilians who were hit with metal bullets from a close distance were killed, indicating Israeli forces’ premeditated intention to claim as many victims as they could among the Palestinian protestors. Following the Friday prayer on May 12th, dozens of Palestinian civilians and Israeli and international human rights defenders organized demonstrations in Bil’in and Nil’in villages, west of Ramallah, protesting against the annexation wall and settlement activities. Israeli forces forcibly dispersed the protests, firing live and metal bullets, tear gas canisters and sound bombs. They also chased the protesters into olive fields and between houses. As a result, many protesters suffered tear gas inhalation while others sustained bruises as Israeli soldiers beat them up. At approximately 13:30 on Thursday, 11 May 2017, dozens of Palestinian civilians organized a protest in solidarity with Palestinian prisoners in the Israeli jails at the northern entrance of al-Birah. The protestors threw stones and empty bottles at the Israeli soldiers stationed at “al-Mahkamah” checkpoint established near “Beit Eil” settlement, north of the city. When the protestors approached the abovementioned checkpoint, the soldiers fired live bullets, tear gas canisters, sound bombs and rubber-coated metal bullets at them. As a result, 13 civilians, including 3 children and 2 women, were wounded. Eight civilians sustained live bullet wounds, 4 others sustained metal bullet wounds and a civilian sustained a live bullet shrapnel wound. The wounded civilians were transferred to Palestine Medical Complex in Ramallah to receive medical treatment. Their injuries were classified as moderate. Following the Friday prayer on 12 May 2017, hundreds of Palestinian civilians performed the prayer at the crossroad of Beta village, south of Nablus upon a call from the National Committee to Support the Prisoners to perform the Friday prayer in the confrontation areas with the Israeli forces to support the prisoners’ legitimate demands. At the end of the prayer, the civilians threw stones and empty bottles at the Israeli soldiers, who fired live and metal bullets, sound bombs and tear gas canisters at them. As a result, an 18-year-old civilian sustained a metal bullet wound to the face. He was then transferred to Rafidia Governmental Hospital in Nablus for medical treatment and later left the hospital. Following the same Friday prayer, hundreds of Palestinian civilians performed prayers at the entrance to Beit Furik village, east of Nablus, upon a call from the National Committee to Support the Prisoners to perform the Friday prayer in the confrontation areas with the Israeli forces to support the prisoners’ legitimate demands. At the end of the prayer, the civilians threw stones and empty bottles at the Israeli soldiers, who fired live and metal bullets, sound bombs and tear gas canisters at them. As a result, a 45-year-old civilian sustained a metal bullet wound to the head. He was then transferred to Rafidia Governmental Hospital in Nablus for medical treatment and later left the hospital. An ambulance belonging to ‘Aqraba municipality: left-rear window and structure of the ambulance were hit with a metal bullet. The ambulance was travelled by Officer Yusuf Mousa Deriyah. On Friday afternoon, Palestinian civilians organized a protest in the center of Deir Abu Mash’al village, northwest of Ramallah. They made their way to the main entrance to the village in solidarity with Palestinian prisoners, who went on hunger strike. When the protestors approached the abovementioned entrance, the Israeli forces fired live bullets, sound bombs and tear gas canisters at them. As a result, a 21-year-old civilian sustained a live bullet wound to the right leg. At approximately 12:30 on Monday, 15 May 2017, dozens of Palestinian civilians organized a peaceful protest at the northern entrance to al-Birah in solidarity with the Palestinian prisoners on hunger strike and in commemoration of the 69th anniversary of Nakba. The protestors threw stones and empty bottles at the soldiers stationed at al-Mahkamah checkpoint near “Beit Eil” settlement, north of the city. When the protestors approached the abovementioned checkpoint, the soldiers fired live bullets, tear gas canisters, sound bombs and rubber-coated metal bullets at them. At approximately 13:30 on the same Friday, dozens of Palestinian civilians gathered in the center of al-Nabi Saleh village, northwest of Ramallah organized a peaceful protest along with civilians from near villages in commemoration of the 69th anniversary of Nakba. They made their way to the Israeli watchtower established at the main entrance to the village. The protestors threw stones at the Israeli soldiers, who fired rubber-coated metal bullets, tear gas canister and sound bombs at them. As a result, a 45-year-old civilian from Beit Rema village sustained a metal bullet wound to the right leg. He was transferred via a PRCS ambulance to Yasser Arafat Hospital in Salfit to receive medical treatment. On Wednesday morning, 17 May 2017, a number of Palestinian young men gathered at the western entrance to Silwad village, northeast of Ramallah. The protestors closed Street (60) with rocks and set fire to tires in solidarity with the prisoners on hunger strike. The soldiers stationed in the vicinity of “Ofra” settlement, fired live bullets at them in response. As a result, Ibrahim Rasem Hamed (19) was hit with a live bullet and then abducted. Following that, the Israeli forces moved into Silwad village. They raided and searched a number of houses and then closed the main entrance with cement cubes before they withdrew from the village. Due to the number and severity of Israeli human rights violations this week, the PCHR made several recommendations to the international community. Among these were a recommendation that the international community use all available means to allow the Palestinian people to enjoy their right to self-determination through the establishment of the Palestinian State, which was recognized by the UN General Assembly with a vast majority, using all international legal mechanisms, including sanctions to end the occupation of the State of Palestine. PCHR calls upon the international community to condemn summary executions carried out by Israeli forces against Palestinians and to pressure Israel to stop them.